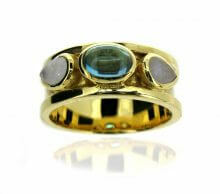 Beautiful sterling silver and gold vermeil ring set with cabochon and faceted moonstones. There are 7 moonstones, sizes ranging from 2mm, 3mm and 4mm round and a 6×4 pear shape. The ring is approximately 12mm wide at the front and 7mm wide at the back. It is approximately 4mm thick. They are all made to order so may differ slightly. Please state ring size. It is also available in 9ct and 18ct gold, please contact us for a price. Stunning chunky silver ring set with faceted blue topaz and moonstones. The stones are dotted all the way round the ring and the sizes range from 4mm – 2mm. The ring is approximately 1.5cms wide and approximately 3mm thick. These rings are all individually handmade so can be adapted to suit your requirements and other stones can be used, please let us know if you would like to discuss other options. Sterling silver and 18ct gold vermeil drum ring set with oval faceted 7x5mm amethyst surrounded by 2 cubic zirconia on either side. The ring is also detailed with small silver blobs highlighted by 18ct gold vermeil. The ring is approximately 1cm in width and approximately 1.5mm in depth at the edges. Seven rings fused together to make one. Three gold and four silver making an interesting and unique ring. The width of the ring is approximately 1.2cm. Please state ring size. Delightful textured drum ring in 18ct gold vermeil set with faceted 6 x 4mm oval blue topaz. The width of the ring is approximately 8mm. Please state ring size. Also available in 9ct gold or sterling silver. Beautiful sterling silver coil ring set with 4 aquamarines and 3 cubic zirconias. The largest aquamarine is 4mm round and the smallest is 2mm round. The ring is approximately 10mm wide at the back and 12mm wide at the front. The rings are all individually handmade so may differ slightly. Please state ring size. 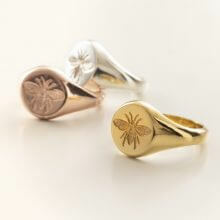 Gorgeous and unique hallmarked honey bee full seal signet rings. They are available in sterling silver, 18ct yellow or rose gold vermeil and 9ct yellow, white or rose gold. The face of ring is 12.5mm across and the shank is 4mm wide at the back. The ring weighs approximately 8.6gms. Please choose ring size. If you would like a ring in 18ct gold please let us know and we will give you a quote. Beautiful faceted sea agate cocktail ring, simple and stylish. The size of the sea agate is 14mm round. Please state ring size.